There was a good turnout for the first match of the New Year at Rookery Waters on Magpie Pool. Out in front was March-based angler Tony McGregor from peg 31. He caught carp to 4lb on bread-punch to finish with 68lb 14oz. Runner-up was Mark Pollard, who fished similar tactics for 56lb 14oz, with third place going to Sean Higginbottom on 42lb 6oz. Float Fish Farm remains a firm favourite for the Webb’s AC anglers, particularly the Horseshoe Pool. It certainly is for Peter Telszewski as once again he topped the field, putting 38lb 4oz to the scales taken on a small pellet feeder. 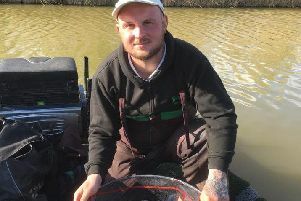 Second was Marcus Webb with 28lb 14oz followed by John Brody on 8lb. Over on the North Level Drain the Tydd Gote matches are still producing reasonable weights. John Taylor won the Wednesday match at Clough Bridge with 12lb 3oz of small fish and Sammy McSpadden won Sunday’s match with 7lb 6oz.